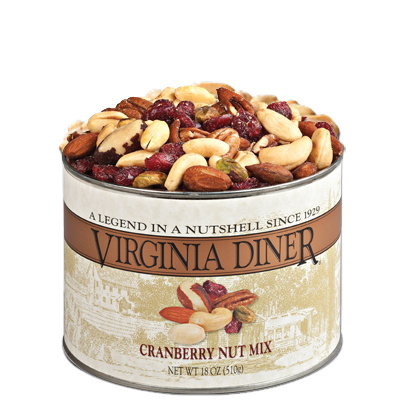 We love the taste of Cranberries mixed with nuts, so we created our newest nut mix with our own Virginia Diner Salted Peanuts, Almonds, Cashews, Pecans, Pistachios, Brazil Nuts, and Sweet tart New England Dried Cranberries. Vacuum packed. 18 oz tin. Peanuts, Expeller Pressed Soybean Oil and Salt, Almonds, Cashews, Peacans, Pistachios: Vegetable Oil (Soy), Salt, Brazil Nuts: Salt, Dried Cranberries: Sugar, Sunflower Oil. Manufactured on Equipment that also Processes Peanuts, Tree Nuts, Soybean, Wheat and Milk Products. 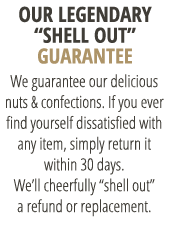 Contains: Peanuts, Soy, Tree Nuts. I sent this as a gift and the receiver was delighted with how big the peanuts were and the delicious flavors. Will order again! Taste a little bland (weak flavor). Would like to have it just a little more salty and also sweeter. I tried the cranberry nut mix for the first time and was not disappointed. Cashews, the greatest peanuts and sweet cranberries were a fabulous snack. Very fresh tasting and good combo. I am eating this to get off less healthful snacks. Good product. I highly recommend! Everything I have received from VD has been great! The Cranberry Nut mix is exceptional. I will be buying this again just so I can have more than a handful. My husband absconded with the entire can on day one! Fresh. Always on time. Probably what I miss most about Virginia.